Christmas trees might be wonderful and beautiful, Advent wreaths are certainly inspirational and Christmas lights can be simply magical, but there is another kind of seasonal decoration that deserves a little enthusiasm, too: the Poinsettia. The beautiful little plant with its remarkable red leaves is more commonly know as the "Christmas Star", the "Winter Rose", the "Mexican Flame Leaf", the "Pascua" or the "Noche Buena" - depending on the country you find yourself in, the language you speak and the botanist you are speaking that language with. The name "Poinsettia" is in fact derived from Joel Roberts Poinsettia, who was the United States ambassador in Mexico in the early 19th century. The man was a dedicated botanist who went looking all over Mexico for new species of plants, and brought the "Euphorbia Pulcherrima" (as it is called scientifically) back to his homeland. Regardless of what you want to call it, the Poinsettia is a stand-out kind of plant: in fact it is a small shrub (that can even grow into a little tree, but the ones that are sold for Christmas are cut down to smaller sizes) that doesn't bear flowers: the way the leaves are organized around the stem of the plant just makes it look that way - and the fiery colours help as well, of course. Poinsettias don't just come in red: they also exist in pink, white and over a 100 different shades. We've mentioned how the Poinsettias are originally from Mexico. Well, there is an interesting Mexican folk legend that tells the story of why Poinsettias actually became linked with Christmas. It goes like this: a poor child wanted to give a present to Jesus on Christmas Eve, but could not afford to go out and buy one. So he picked some weeds instead - just some green stuff he found by the side of the road. It didn't really matter after all: like with any other gift, it's the thought that really counts. And God and his son already have everything anyway - or don't need anything but love and faith. So the child brings the weeds into a church, and all of a sudden they bloom into red flowers. A miracle? 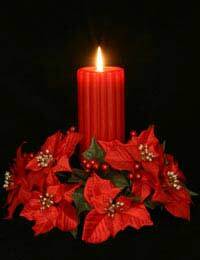 It certainly felt like one to the people present, and so the Poinsettia became the traditional Christmas "flower". More legend? A lot of people believe that the Poinsettia is a poisonous plant. Ok, a lot of plants in the Christmas Star's family are toxic, and you would be forgiven for misreading "Poinsettia" and thinking you saw "poison", but the plant's bad reputation is simply not correct: Christmas Stars can cause allergic reactions in some people, but they are not toxic. In fact, the old Aztecs used the sap of the plant to cure people who were suffering from a bad fever. So don't worry about putting one on your coffee table.